Within the “New Era” has been an attempt by WWE to showcase new talent on the precipice of an ever-growing content generator known as the WWE Network, where fans can not only tune in to live Pay-Per-Views (seven of more which were announced to be added to the already-stacked yearly 12 to make an absurd 19) but go back and watch almost everything WWE has ever produced. That said, sometimes more new content isn’t necessarily the best scenario. 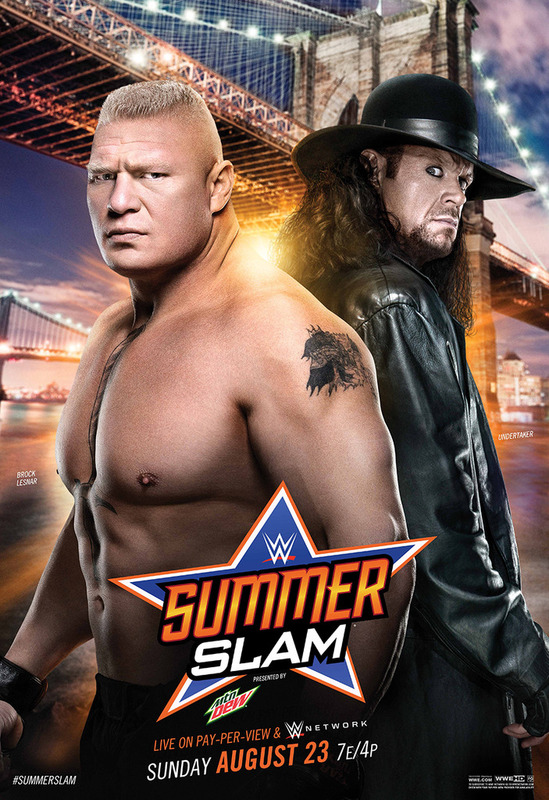 If you count the two-hour pre-show, SummerSlam clocked in and six hours and three minutes with 13 matches. On a stacked Supercard, only a third of it was deemed excellent. The rest of it couldn’t have been more filler if we tried. 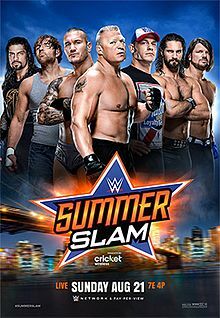 SummerSlam was the personification of having too much of a good thing and not knowing how to properly utilize it. – The Triple H-Seth Rollins backstage segment was pretty straight forward, setting the scene for Trips to congratulate Rollins on beating John Cena at SummerSlam the previous night, retaining his WWE World Heavyweight Championship and becoming new United States Champion. God help us, they actually designed a statue. This hyped the “unveiling” for things later on, which was all fine and good. Kind of odd that they neglected to mention the actions of Jon Stewart, but them being delirious heels, that was most likely on purpose. “Notes In Observance” features random thoughts an analysis on recent television shows. Quick results can be found at the bottom of the post. – Booker T, why would Roman Reigns have to pay a ticket to see a show he is currently on? Head-scratcher. 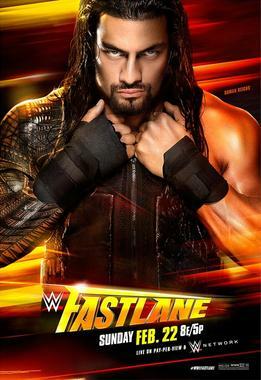 The opening segment with Reigns and Seth Rollins shoved the Jon Stewart-Rollins celebrity rivalry to the forefront. The crowd wasn’t receptive for Roman, but being it was Jersey, you can’t be shocked. An audible CM Punk chant broke out during the segment, which also couldn’t have been good. For what it’s worth, the crowd did positively react to Reigns punching Rollins and spearing J & J Security. Making Reigns look tough and ruthless is the only way to go and the “One vs All” dynamic is a good way to describe his WrestleMania push, quite frankly. – The backstage segment with Rollins, J & J Security and Randy Orton was interesting in Orton trying to “help” Rollins and sort of gave a glimpse into what could happen in the future (obvious official turn on Authority) but we’re not there yet. This needs to happen sooner than later. Even when Orton turns, we’ll be right back to where we were after FastLane. – The Dean Ambrose-Bad News Barrett match had R-Truth on commentary yet again, which wasn’t bad. When allowed to utter more than “What’s Up?” he is entertaining enough to root for. The match was okay, but continued the godawful trend of Barrett having his Title stolen by Truth again and losing yet another match. The random appearance of Luke Harper walking out with the belt added something new. This isn’t making the belt look prestigious, it’s making it look like a toy. Pathetic. Does Ambrose earn two Title shots now with multiple wins over Barrett? He should. It’d make about a much sense as what they’re currently doing. – It can never be a good thing when the whole locker room is backstage, but it had promise because it was related to The Miz. Damien Mizdow upstaging Miz and subjecting him to public ridicule with an erectile dysfunction commercial was a good, yet edgy way to go. They’re teasing the official turn slowly with it getting closer and closer, well done. – Bray Wyatt’s stage promo with the burning casket was a good promo with a visually stunning image, if you will. There was a moment of tease, but no Undertaker. He’ll have to appear sooner than later. Can Wyatt drag this out until Mania? Our hopes are slim on that, when this could be a bigger feud if Taker would throw his two cents already. – The Tyson Kidd/Cesaro/Natalya-Usos/Naomi match was okay and continued their program and established rocky waters again between Natalya and Kidd, with Natalya upset being the one to lose the match an Kidd made up by consoling her. Where will this ultimately lead? There’s more money in Natalya with Kidd than against him. The flip-flopping isn’t working. – The segment with John Cena and Stephanie McMahon worked mainly because of Steph’s bluntness. You have to question the risky logic behind leaving Cena purposely off the Mania card so far, but McMahon tore into Cena well and made some valid points. It’s funny she actually encouraged the crowd to chant for her point. What better way to kill the awesomeness than with Curtis Axel, though it sort of played into the Mania conversation. Cena’s serious “warning” to Axel was somewhat heelish, but expected. Axel playing to the crowd with Hulk Hogan’s mannerisms was good for a laugh or two. When Rusev/Lana came out and teased a possible acceptance just to say no, it continued the anticipation per se. Cena’s driven and Rusev isn’t convinced. We can bet the match will happen, but will there be a cheesy stipulation? Stay tuned. – The sit-down interview clip with Michael Hayes and Arn Anderson validating Sting’s credibility was a nice touch to add, but it’s not like blonde-haired Sting was a star the caliber he is now. – The rematch for the Divas Championship with Paige and Nikki Bella was more intriguing than usual for a Divas match with Paige seconds away from winning and having Brie attack her. This all cleverly set up AJ Lee’s return. Had to know the CM Punk chants would happen too. – The AJ-Paige backstage segment played up their past history and explained why they were teaming together as they both had a common enemy. Closing loopholes doesn’t happen often enough in WWE and happy it did here. – “The Daily Show with Seth Rollins” segment turned from comedic to quite serious as Stewart planted seeds of doubt in Rollins’ head with a better-than-average wrestling promo. It’s good when WWE brings in celebrities that actually know the product and don’t bore the audience to death. This also led to Orton making his appearance, intentionally yet unintentionally allowing Stewart to escape. Foreshadow much? – Stewart’s backstage promo was awkward, nervous and witty, which sounded about right for how he’d respond to the last segment. Is this the last of him in WWE or will he have a role in Mania? – Is Harper having “fireflies” in his Titan Tron entrance done intentionally? This would show a loose tie to Wyatt. Harper needs something more to his character as his abilities are underutilized. Right now, he’s basically “that guy with the eyes who could wrestle.” That said, Harper can get over on his own more as a singles guy, where guys like Erick Rowan need Ryback and Dolph Ziggler to do so, and that is even a stretch. – The Harper-Daniel Bryan match wasn’t too long but they made the most of it. Bryan getting the win kept him going strong and there was more IC Belt hot potato as Ziggler ended up with the belt now. Disappointing involvement for Bryan considering where he was about a month ago, but all this could’ve been righted if he was just put in to the World Title match at Mania. You only get one Mania a year. Why try to purposely derail the popularity of who was the most over guy in the company upon his return? They’ve smushed him down to the upper mid-card. We have to wonder if he will ever get a lengthy run with the Title. – Cool to see Alundra Blayze get the nod for WWE HOF. Also good to see them play up the moment she was known most for – dumping the WWE Women’s Championship into a trash can on Nitro. – The backstage segment between Orton and Rollins continued the tension of Orton demanding a thank you and having the rest of the Authority members shun him away. – The Paul Heyman promo was epic on many proportions. We use “epic” loosely, but more or less, Heyman used his angry voice for shock value and spoke to casual fans and insiders alike. He’s one of few promo-cutters in the business that can successfully pull this off. The mic going out several times on two separate mics had to be more than a coincidence than faulty sound. Heyman could damn near hype this Mania match on his own. – The Reigns-Rollins (w/J & J Security, Kane, Big Show) main event match was somewhat entertaining but was mainly known for the result of Orton helping Reigns win the match and the utter dominance shown by Reigns in the final minutes with the over the top rope and spear. This helps Reigns get over, but with Mania getting closer, we still haven’t really seen a real reason to cheer for Reigns against someone like Lesnar on the biggest stage. When it was all said and done, we got everything we expected WrestleMania to look like so far, but nothing was outstandingly memorable here about the way we got there. Considering it’s the Road to WrestleMania, this should be Creative’s slickest story-churning to date. Every possible chance to get the fans to stand on their feet and be truly invested in what they were seeing was thrown away on this show and thus, we’re left with the end-result, similar to that of a soggy, sad deli sandwich. In the end, the result is what you expect, sure – but that’s the best quality you can offer us? – The pre-show MizTV segment with Paul Heyman allowed the Miz/Damien Mizdow ongoing conflict to continue as Miz made Mizdow literally sit in the corner. Funny. Heyman also soaked up the heat here and sounded poised and confident of his client’s abilities. Nothing else beyond that besides a tease of Mizdow standing up to Miz. That moment is more likely at Mania. – The opening hype video was slick and cool, but then again, looked a little too much like Adrian Neville’s titantron montage. – Maybe one day WWE will go back to individual sets for PPVs. It used to bring an aura of mystique to the shows. How special can a PPV look when it looks like a glorified Raw? – The Dolph Ziggler/Erick Rowan/Ryback-Seth Rollins/Kane/The Big Show match was what we expected: filler. Cole’s explanation of Ziggler/Ryback/Rowan teaming together as “rebels” left a lot to be desired. Not what you think of when “rebel” comes to mind. The overall action was okay, but the KO finish on Ziggler brought back bad reminders of the Royal Rumble. Regardless, the right team went over as this is hopefully the last we see of the trio. This was also the best time to have Randy Orton make his return as he cleared house of The Authority. Most likely, seeds for an Orton-Rollins Mania match were planted. – The Dusty Rhodes-Goldust backstage segment carried on the family feud from Dusty’s perspective and tried to paint a sympathetic picture with a bit of a twist at the end. – The Stardust-Goldust match clearly had more focus on the story than the wrestling itself, if you even want to categorize it as such. Little things told us Stardust was breaking into his own, such as being shirtless with his new ring attire and also playing to the crowd’s “Cody” chants. The finish was odd in that it wasn’t expected and just confused mostly everyone. It didn’t even look as if the Ref’s hands touched the mat, which the announcers also brought into question. – The hype behind Jon Stewart and Seth Rollins made sense to show, but where does it lead? – The segment with Stardust attacking Goldust was what needed to happen here. It was good to see him reference his old character and call Goldust “the attitude era never ends but oh it did.” That actually did more than the match did. – The Tag Team Championship match between The Usos and Tyson Kidd/Cesaro was quite solid down the stretch once the pace quickened. It was a clean victory as well, so as predicted, this makes The Usos the hunters for Mania time. Hopefully, Kidd/Cesaro make the most of their time as Champs. – The Sting-Triple H face-to-face interaction segment was solid in that it successfully set up their WrestleMania match. WWE is playing the WCW circa 1997 card with Sting and keeping him silent against a heel stable and sporadically appearing. This makes him more intriguing. Will he stay silent though? He should. How much cooler was him pointing the bat at Triple H and then the WrestleMania sign as his “silent” persona? – The Divas Championship match between Paige and Nikki Bella was the bathroom break affair we were all waiting for. Nikki did it all on her own but still by dirty tricks. Yawn. – The Intercontinental Championship match between Dean Ambrose and Bad News Barrett had them make the most of the time they had, but it ended before it could really get going. So, Barrett looked like a coward and Ambrose punched his way to a DQ? Who came out of this looking better? Ambrose leaving with the Title belt fits his “loose cannon” character at least. Still kind of lame though, following lackluster results from previous matches. – What better way to introduce The Undertaker than just to have him come out and be Bray Wyatt instead? Consider everyone trolled. Somewhat. His promo was strong and confirmed what we figured all along, but this has been going on for weeks now. The fans were probably more receptive when they thought it was Taker mainly to see what his reaction would be. They wouldn’t get that here. – The United States Championship match between Rusev and John Cena took some time to get going but once it did, it was very entertaining. Yes, Rusev won by submission, but he had help from Lana and that is ultimately Cena’s out. Don’t look at this as the finale. That’s still likely to come, with a cheesy stipulation in store. – The Daniel Bryan-Roman Reigns match was a good match as Bryan carried Reigns well to his best singles match to date. The crowd was very much behind Bryan and a finish like this probably turned the crowd even more – as decisive as it was. Now Bryan has been crushed twice trying to get to WrestleMania. The fans didn’t buy too much into the sportsmanship either. So, this was all just a way to get Reigns more fairly to Mania. Give WWE credit – they’re not backing down from sticking with Reigns, but will their fans stick through to Mania to want to see him fight Lesnar? That’s the true question here.